At least this time it’s only for the evening! 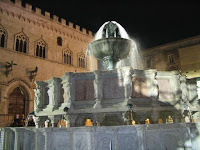 Tonight from 9pm until tomorrow morning early residents of Perugia’s historic center won’t have any water. No, it’s not an emergency, just an opportunity for the town to replace some old water mains, work that will all be done in a night. Perugia’s water supply is a good history lesson. The oldest well in the city is the Etruscan Well, dug more than 2,400 years ago straight down (111 feet) into the bedrock. Legend has it that when the city’s acqueducts were bombed at the end of World War II, residents simply dropped their buckets into the Etruscan Well’s still-pure waters. In the Middle Ages that well and the city’s others didn’t quite meet the demand for H2O, so engineers built (starting in 1255) an enormous collecting tank on a hillside six miles away and then constructed an acqueduct which ended at Perugia’s beautiful Fontana Maggiore. This acqueduct kept the city supplied until more modern ones were added in the fifties. Given all that history, we guess that Perugians (and Umbra students, who are “temporary citizens”) can’t complain too much if it’s just for the night!